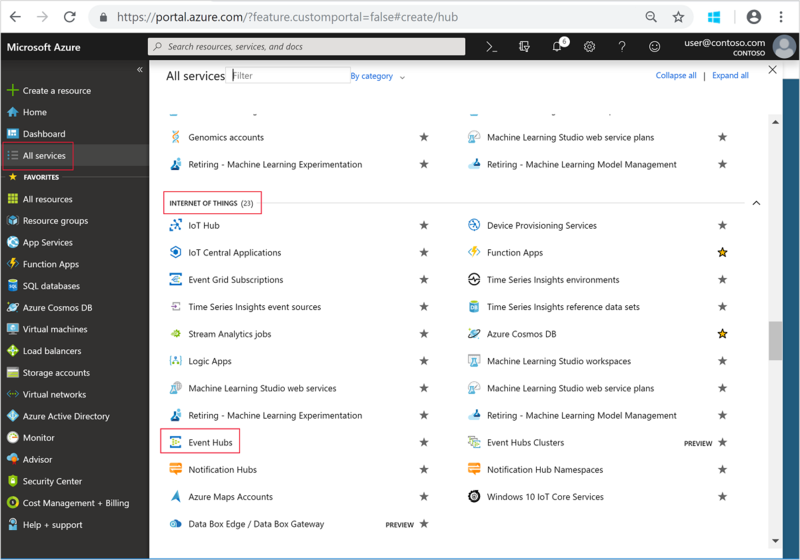 In this tutorial, you Learn how to create an Apache Spark streaming application to send tweets to an Azure event hub, and create another application to read the tweets from the event hub. For a detailed explanation of Spark streaming, see Apache Spark streaming overview. HDInsight brings the same streaming features to a Spark cluster on Azure. If you don't have an Azure subscription, create a free account before you begin. Complete the article Tutorial: Load data and run queries on an Apache Spark cluster in Azure HDInsight. To receive a stream of tweets, you create an application in Twitter. Follow the instructions create a Twitter application and write down the values that you need to complete this tutorial. Browse to Twitter Application Management. Name: provide the application name. The value used for this tutorial is HDISparkStreamApp0423. This name has to be a unique name. Description: provide a short description of the application. The value used for this tutorial is A simple HDInsight Spark streaming application. Website: provide the application's website. It doesn't have to be a valid website. The value used for this tutorial is http://www.contoso.com. Callback URL: you can leave it blank. Select Yes, I have read and agree to the Twitter Developer Agreement, and then Select Create your Twitter application. Select the Keys and Access Tokens tab. Select Create my access token at the end of the page. You use this event hub to store tweets. From the left menu, select All services. Under INTERNET OF THINGS, select Event Hubs. Name: Enter a name for the event hub. The value used for this tutorial is myeventhubns20180403. Subscription: Select your appropriate subscription. Resource group: Select an existing resource group from the drop-down list or select Create new to create a new resource group. Location: Select the same Location as your Apache Spark cluster in HDInsight to reduce latency and costs. Enable Auto-Inflate: (Optional) Auto-inflate automatically scales the number of Throughput Units assigned to your Event Hubs Namespace when your traffic exceeds the capacity of the Throughput Units assigned to it. Auto-Inflate Maximum Throughput Units: (Optional) This slider will only appear if you check Enable Auto-Inflate. Select Create to create the namespace. The deployment will complete in a few minutes. Select your Event Hubs namespace from the list. From the Event Hubs Namespace page, select + Event Hub. Name: Give a name for your Event Hub. Select Create. The deployment should complete in a few seconds and you will be returned to the Event Hubs Namespace page. Under Settings, select Shared access policies. 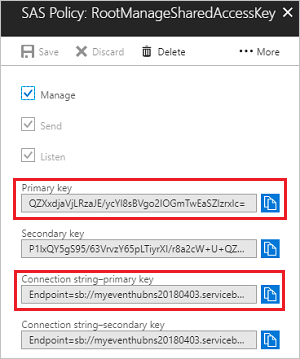 Save the values of Primary key and Connection string-primary key to use later in the tutorial. Create a Jupyter notebook, and name it SendTweetsToEventHub. val eventHubName = "<Event hub name>"
val eventHubNSConnStr = "<Event hub namespace connection string>"
val twitterConsumerKey = "<CONSUMER KEY>"
val twitterConsumerSecret = "<CONSUMER SECRET>"
val twitterOauthAccessToken = "<ACCESS TOKEN>"
val twitterOauthTokenSecret = "<TOKEN SECRET>"
// Getting tweets with keyword "Azure" and sending them to the Event Hub in realtime! 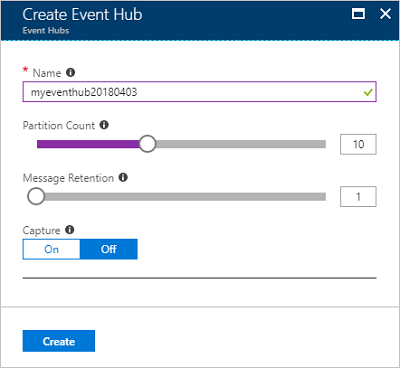 Open the event hub in the Azure portal. On Overview, you shall see some charts showing the messages sent to the event hub. Create another Jupyter notebook, and name it ReadTweetsFromEventHub. With HDInsight, your data is stored in Azure Storage or Azure Data Lake Storage, so you can safely delete a cluster when it is not in use. You are also charged for an HDInsight cluster, even when it is not in use. If you plan to work on the next tutorial immediately, you might want to keep the cluster, otherwise go ahead, and delete the cluster. Open the cluster in the Azure portal, and select Delete. You can also select the resource group name to open the resource group page, and then select Delete resource group. By deleting the resource group, you delete both the HDInsight Spark cluster, and the default storage account. Read message from an event hub. Advance to the next article to see you can create a machine learning application.